There are currently 61 Palestinian women prisoners in Israeli jails, according to reports by the Asra Media Center. They include 10 minor girls and five women jailed without charge or trial under Israeli administrative detention, including Palestinian parliamentarian, national leader and leftist feminist Khalida Jarrar. On Sunday, 6 August, Palestinian prisoner Dalal Abu Hawa, 39, from occupied Jerusalem, was released after a 12-month sentence inside Israeli occupation prisons. She was seized on 28 August 2016 and accused of transferring funds to Palestinian prisoners in Israeli jails, especially those affiliated with Hamas. She is also barred from entering her home city of Jerusalem. Her son, Omar, 17, is a Palestinian child prisoner who has been jailed for 17 months out of a two-year sentence, accused of throwing stones at occupation forces. She is the mother of six children and was separated from her then nine-month-old baby by her arrest by Israeli occupation forces. At the same time, on early Sunday morning, Amina Abatli, the wife of Palestinian prisoner Adib al-Ghoulban, was seized by Israeli occupation forces along with eight other Palestinians. Al-Ghoulban has been held in Israeli prison for one and a half months and was ordered to administrative detention without charge or trial; first his uncle, Khamis al-Ghoulban was arrested by occupation forces and now his wife. The number of women prisoners in Israeli jails has escalated in the past several months. There are reportedly 25 women held in Damon prison and 36 in HaSharon prison. 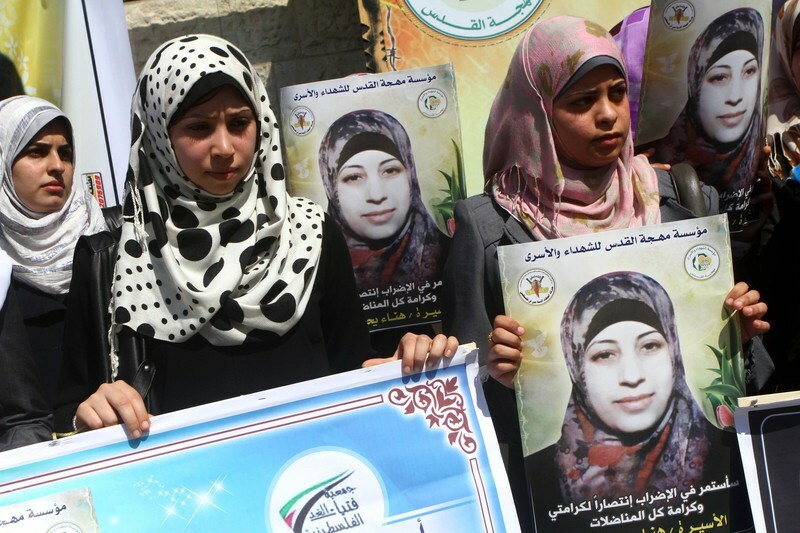 29 of the Palestinian women prisoners are still subjected to ongoing interrogation and have not been sentenced. 25 Palestinian women have been sentenced and are serving sentences of eight months to 16 years, and five women are held without charge or trial under administrative detention. There are 10 Palestinian minor girls held in HaSharon prison, in addition to multiple 18-year-old women who have been jailed since they were girls and were sentenced as minor girls. One of the youngest women in Damon prison is Jamila Daoud Jaber, 18, of Salfit; she turned 18 while jailed by the Israeli occupation forces. She has been imprisoned since 7 May 2016. Esraa Sameeh Jaber, 18, from al-Khalil, has been imprisoned since 12 February 2017 and is not sentenced until today. Also from al-Khalil are Nour Zureiqat, 18, imprisoned for one year, and Lama al-Bakri, 17. Amal Jamal Kabha, 17, from Jenin, is serving an 18-month sentence. She has been jailed since August 2016. Marah Louay Jaidi, 16, from Qalqilya, has been imprisoned since early 2017. The Jerusalemite prisoner, Malak Yousef Suleiman, 16, has been jailed since 9 February 2016 and like other Jerusalemite child prisoners, has been subject to an extremely lengthy sentence of 10 years. Some of the other young Jerusalemites who have been subject to lengthy sentences include Marah Bakir, 18, sentenced to 8 years imprisonment, Nurhan Awad, 18, sentenced to 13 years imprisonment, and Manar Shweiki, 18, sentenced to 6 years in prison. All three were minors when seized by occupation forces and imprisoned. A fellow child prisoner among the Palestinian girls is Hadia Ibrahim Arainat, 16, from Jericho, imprisoned since 3 March 2016 and serving a 3-year sentence. Malak al-Ghaliz, 14, is the youngest Palestinian girl prisoner, imprisoned since 20 May 2017, charged with possession of a knife. The ages of the women prisoners range from 14 to 59 years. The eldest woman prisoner is Ibtisam Mousa, 59, of Gaza, seized on 19 May 2017 as she attempted to cross the Beit Hanoun/Erez crossing – in full possession of a permit from the Israeli occupation – accompanying her sister as she sought treatment for cancer. The two Palestinian women prisoners serving the longest sentences are Shatila Abu Ayada, 24, from Kufr Qasem and a Palestinian from ’48, and Shurouq Dwayyat, 20, a Palestinian student from Jerusalem. Both are serving 16-year sentences inside Israeli occupation prisons and were subject to massive and highly disparate and unjust sentencing. There are 11 women prisoners from Jerusalem and 12 from al-Khalil. Palestinian parliamentarian and leftist national leader Khalida Jarrar, 54, was ordered to six months in administrative detention after she was seized by Israeli occupation forces on 2 July. Also ordered to administrative detention was Khitam Saafin, the President of the Union of Palestinian Women’s Committees, jailed for three months without charge or trial after she was seized simultaneously with Jarrar on 2 July. Sabah Faraoun, 35, from Jerusalem, has been imprisoned without charge or trial under repeatedly renewed detention orders since 19 June 2016. Ihsan Dababseh, 32, was ordered to six months in administrative detention after she was seized by occupation forces on 27 February 2017. Afnan Ahmad Abu Haneya, 21, from Ramallah, was recently ordered to three months in administrative detention. They are among approximately 500 total Palestinians imprisoned without charge or trial under administrative detention orders, which are indefinitely renewable. Palestinians have routinely spent years at a time jailed under such orders.